I'd not heard the term 'whiskey bonding' until last week, at the third of the Irish Embassy's annual presentations of 'craft drinks' from Ireland, when I tasted a new whiskey called JJ Corry The Gael, from a producer called Chapel Gate. 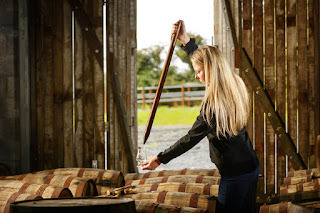 When I met new-wave Irish craft whiskey producers before – yes, there's 'craft' everything these days – I discovered that while some were building distilleries, they were also buying ready-distilled spirit in from elsewhere and ageing and blending it for sale. For many – including two excellent examples I'd tasted earlier that evening, namely Boann Distillery's bourbon and sherry-aged The Whistler, and Writer's Tears from Walsh Whiskey – this is so they can get their brand to market and have some money coming in while they get their distillery up and running. Chapel Gate currently has no plans to distill its own spirit, however. Instead, founder Louise McGuane talks of reviving whiskey bonding, which she describes as a 19th century tradition where wholesalers and even pubs would buy in whiskey and age it 'in bond', which is to say without tax paid. Like them, she buys in various old barrels and the spirit to fill them with, or even ready-filled barrels. Once the whiskey is aged – and the main flavours of whiskey all come from the barrels – she combines the many different flavours to create her preferred blend. The result is lighter in colour than the others I tried, lightly fragrant, fruity and smoky, and perhaps a little drier too. As soon as I heard the story (there's a fuller version here), I recognised it: it is also the story of Scotch blending, and it is how well-known names such as Chivas Regal and Famous Grouse originated. The big difference is that in those cases the same company now owns both the blend(er) and the contributing distilleries.